Funded by a $1 million Alfred P. Sloan Foundation grant, the OJS-DVN project intends to develop a plugin for journals that are using the Open Journal System (OJS), a journal management and publishing system that has been developed by the Public Knowledge Project (PKP), to expand and improve access to research. OJS is open source software made freely available to journals worldwide for the purpose of making open access publishing a viable option for more journals, as open access can increase a journal’s readership as well as its contribution to the public good on a global scale. More than 11.500 journals currently use OJS. 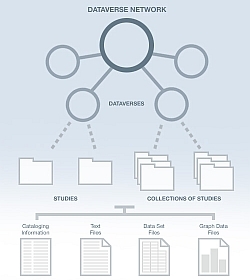 The Dataverse Network is an open source application to publish, share, reference, extract and analyse research data. It facilitates making data available to others, and facilitates the replication of others research. Researchers, data authors, publishers, data distributors, and affiliated institutions all receive appropriate credit. The integration of the OJS-DVN plugin allows journals to facilitate research data sharing and archiving by setting up a plugin in their Open Journal Systems installation for authors to be able to deposit their research data at the same time as their article from the journal’s article submission system. This plugin will complement and/or replace OJS’ current “supplementary files” option, and will also provide access to Dataverse Network data preservation, citation and analysis tools at the journal/article level. OJS Journal integration with the Dataverse Network will be available for any OJS journal that wishes to implement easy data sharing and archiving, and enhance their published articles with links to data. The OJS-DVN project website offers an overview of the project, in particular a high-level workflow and a couple of mockups. In my opinion this project is a very valuable and useful approach to facilitate replication of research results in the social sciences and beyond!